“It was with great sadness that we learned of the death of Emeritus Professor Brian Moss on Friday, 27 May. He informed his close friends that he was terminally ill just after New Year and since then he has provided a very upbeat, indeed somewhat humorous, series of emails with respect to his condition. 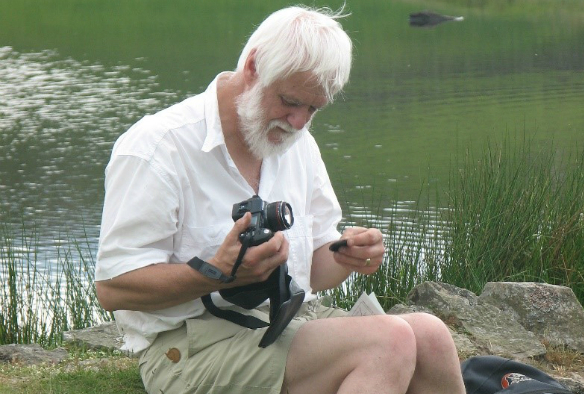 Brian was a polymath, a true ‘Renaissance Man’, but was best known as perhaps the most influential freshwater ecologist in Europe over the past three decades, and without doubt the world’s leading scientist on shallow-lake ecology. Much of his research extended well beyond lakes – for example his identification of alternative stable states, studies on trophic dynamics, and his work on climatic effects on lake ecology. He was an inspirational teacher –not only to University students but to many fellow professionals in a wide range of disciplines. Born in 1943 in Stockport, his school days were spent identifying plants in the Peak District before undergraduate studies and a PhD in Botany supervised by Frank Round at the University of Bristol. He then spent time abroad, studying tropical limnology at Lake Chilwa in Malawi, and thereafter the impacts of nutrients and fish predation on the structure of a deep, eutrophic lake in Michigan using large-scale experiments. His next move, to the University of East Anglia (UEA), saw him blossom further in the interdisciplinary School of Environmental Sciences, beginning his world-renowned work on the eutrophication of the Norfolk Broads. At this point, he also entered the field of restoration ecology, making a first attempt at restoring the conservation value of such systems through bio-manipulation – innovatively engineering fish communities and zooplankton grazers to affect algal stocks. He was involved in projects that led to removal of phosphate from several Broadland wastewater treatment works. He has maintained an active research interest in the Broads ever since and his popular ‘New Naturalist’ account (The Broads) summarised their history and ecology, all interwoven with Brian’s radical ecological thinking. Some seventeen years after joining UEA, Brian succeeded Professor Tony Bradshaw FRS as Holbrook Gaskell Professor of Botany at the University of Liverpool. Here he continued his research on shallow lake systems in the North West of England. He also developed an extensive experimental pond system at Ness Botanic Gardens where he assessed ecological function in relation to nutrient and climate manipulation – in other words pond-warming. This was yet another ground-breaking step with which others are still trying to keep pace. Brian was a superb communicator and a very popular plenary speaker. He has been President of the British Phycological Society, Vice-president of the British Ecological Society, and both Vice-president and President of the International Society for Limnology, and for seven years (from 1981) edited the Journal of Ecology for the British Ecological Society. In 2007 he was awarded the August Thienemann–Einar Naumann Medal – the highest international honour for outstanding contributions to scientific limnology; in 2009 the Excellence in Ecology Prize awarded by the International Institute of Ecology; and in 2010 the Institute of Ecology and Environmental Management’s Medal. Part of the former prize was the freedom to write a book on ‘anything of his choosing’. The outcome was a tour de force: Liberation Ecology, a scientific textbook written for the general public, using parallels in religion, art, music, and his mother–in-law’s washing line to get over complex issues of ecology and environment. Liberation Ecology was, in turn, awarded a prize: the Marsh Christian Trust Ecology Book Award by the British Ecological Society. Brian’s eighth book Lakes, Loughs and Lochs, also in the ‘New Naturalist’ series, moved his radical ideas on environmentalism forward. Brian was awarded a DSc by the University of Bristol in 1981, and in 2014 an Honorary Degree (Fellowship) at the IHE, Delft. Also in that year he became Acting Director of the Ecology Institute (Kinne Foundation) in Germany. Beyond this very impressive curriculum vitae, Brian had three important qualities that were altogether more human. The first was an uncompromising approach to ‘doing the right thing’ environmentally and in his relations with others. He was always prepared to argue his corner, quietly and effectively. He did this always with the politeness and elegance of a true gentleman, and without causing upset. However, he had no truck with bureaucracy for its own sake, seeing it as an unnecessary intrusion, preferring to trust students, staff and colleagues to take responsibility for their own actions. Second, Brian was a superb, boundlessly enthusiastic and inspirational speaker. His taught courses often attracted an audience from those who were not enrolled, particularly for sessions in which he conducted second year students in Flanders and Swann’s immortal song, “The Hippopotamus”. Brian’s rendering is now so famous that it can be viewed on YouTube, where it has scored thousands of hits. He was a brilliant field teacher. Latterly, the honours field courses were smattered with substantive arguments between Brian and myself; the students would often say, “you argue like a married couple”. Third, Brian had an utterly compelling sense of humour. In the last ten years or so at Liverpool he took up playing the double bass, recording faithfully his progression through each musical grade on all annual reports to the University. Even his research grant applications were graced by knowledge of his current musical level. He eventually joined the Southport Orchestra, eventually becoming its chairman. Professionally, he was very keen that the University of Liverpool develop a School of Environmental Sciences; indeed he believed every student should be taught about the environment, and played a key roles in its formation. All of these idiosyncrasies made Brian an enigmatic but truly inspirational leader in environmental science. However, none of his quirks have ever diminished his influence as an individual moved by his unfailing commitment to the environment, and by the conservation ethos of one his great heroes, Aldo Leopold. It is impossible to capture Brian’s true scientific contribution, huge character and sense of fun in these few lines. Perhaps the most apposite distinction is to borrow from Brian’s great hero Leopold himself, to say that: “There are some who can live without wild things and some who cannot”. Brian Moss, clearly, was in the latter group. But hugely more important is that, through his work and actions, he has made it far more likely that so many of the rest of us sit there too, and for this all of us who knew him owe him a huge debt of gratitude. In his introductory lecture to incoming science students he always finished by advising them with the lines from Hamlet, “to thine own self be true”; Brian certainly lived up to this maxim.